Refresh your heart and your mouth! 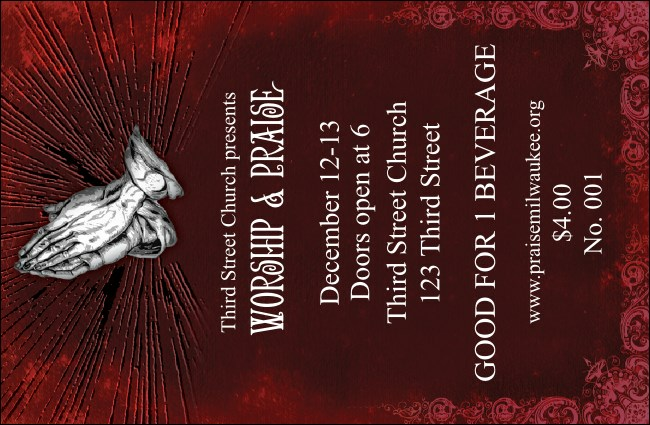 Rejoice in the Gospel Drink Ticket, a lovely red and grey ticket template with praying hands against an ephemeral background and ornate scrolling, perfect for selling refreshments in conjunction with any event featuring spiritual or sacred music. Raise your spirits while you raise your revenue with the right Event Kit from TicketPrinting.com.